Hello friends! Are you excited about the holidays? 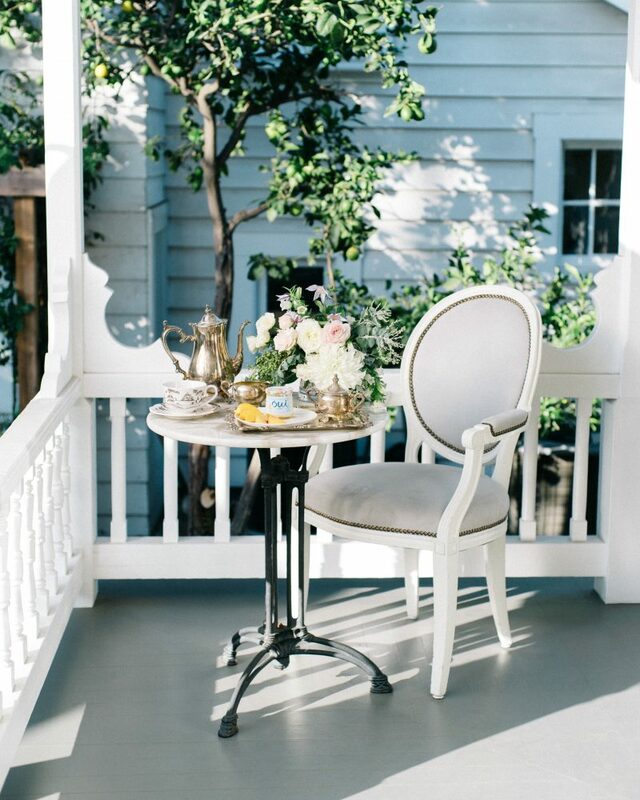 With all the stress that comes with this time of the year, it’s a good time to relax with a little teatime. 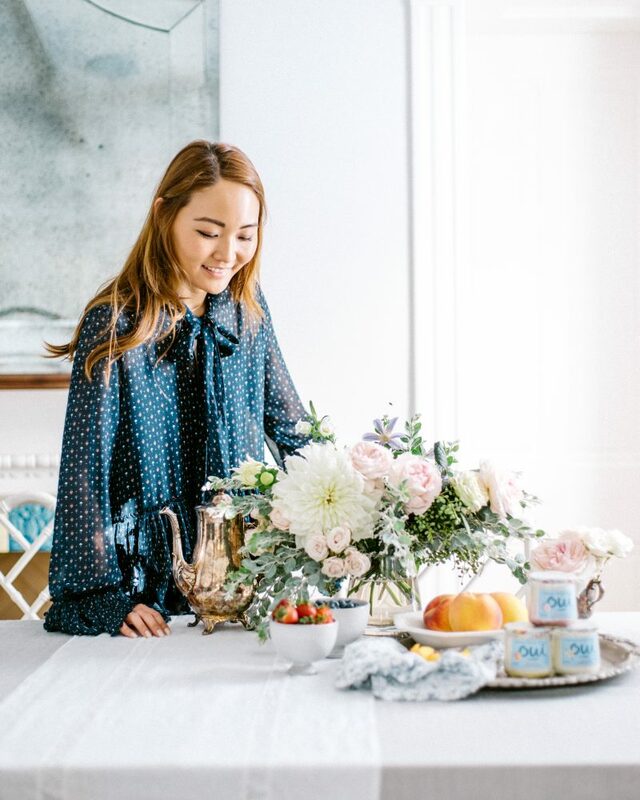 Tea parties are a fun way to catch up with friends, celebrate special occasions, and a great tradition to pass onto your children. So, what do you serve at tea parties other than tea? 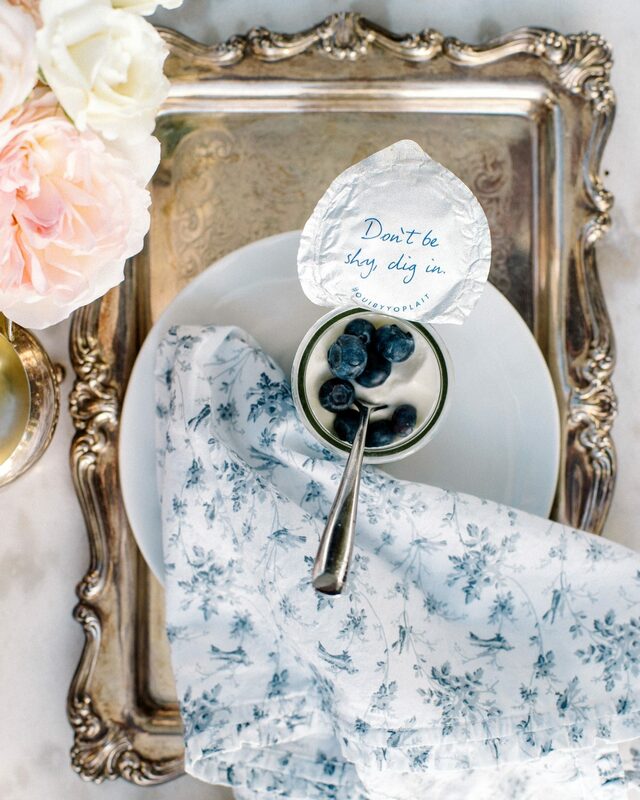 While there’s nothing wrong with a cookie, I like serving fruit and yogurt at my get-togethers. 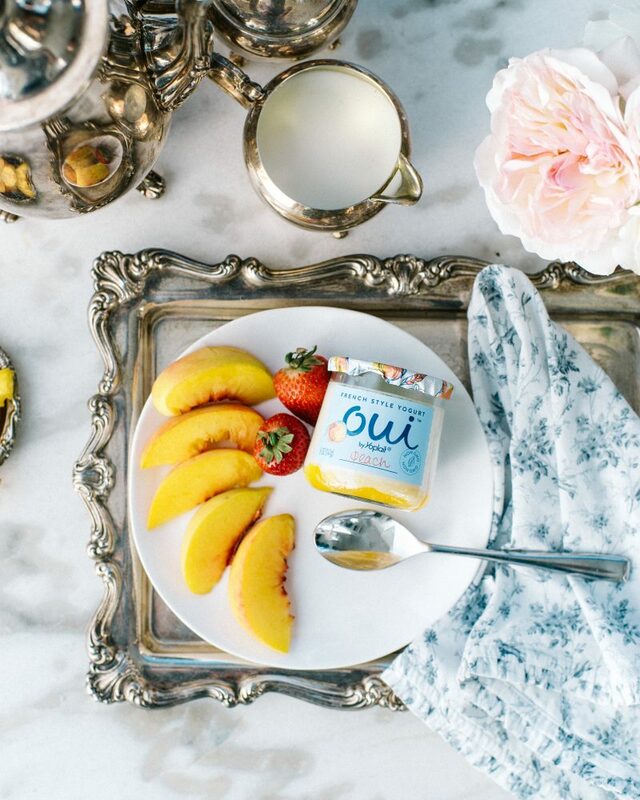 I especially love French style yoghurt by Yoplait, my all-time favorite brand. 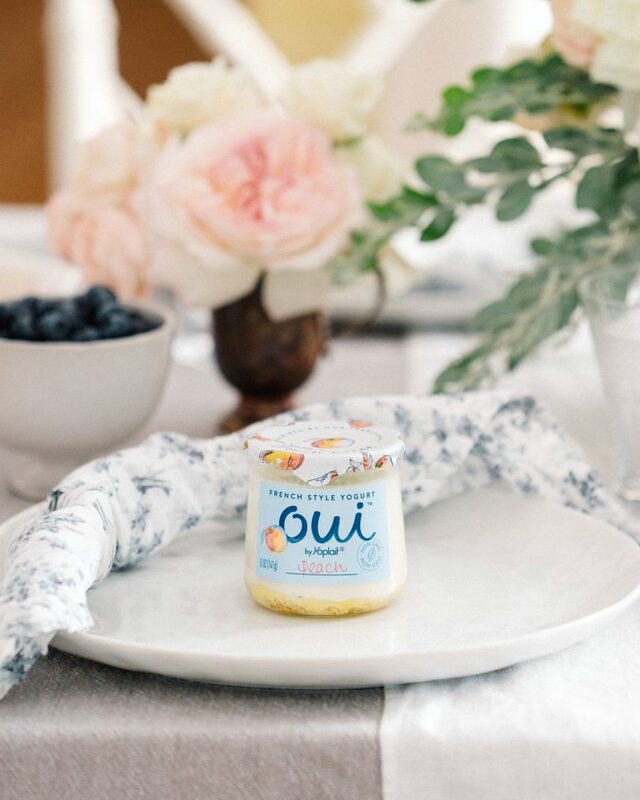 Yoplait yogurts are unstrained and made with whole milk, giving them a luxuriously smooth, creamy texture and a sweet, yet tart taste. They’re each packaged in adorably quaint glass tubs, which makes them the perfect size for reuse. 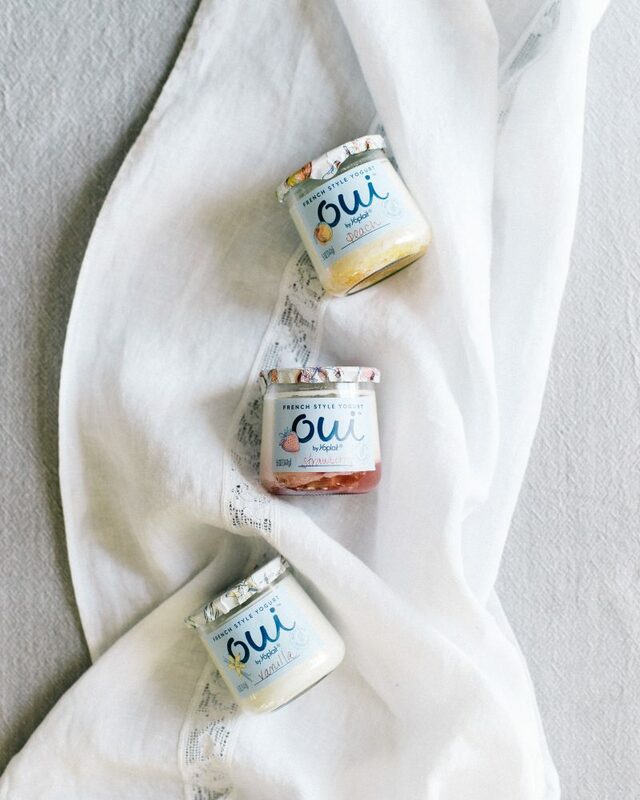 These glass jars made in France are also what protect the product, resulting in the difference in texture between other store-bought brands. Either way, I absolutely love anything set in a glass, even glass milk. 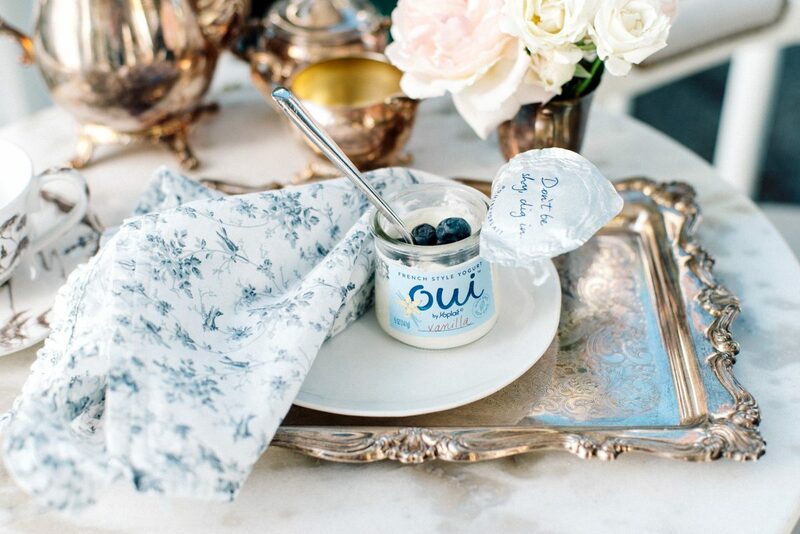 I collaborated with Yoplait for this styled shoot to introduce their latest range of French-style yogurts, named “OUI.” It was super exciting to work with their brand because I grew up eating Yoplait yogurt! 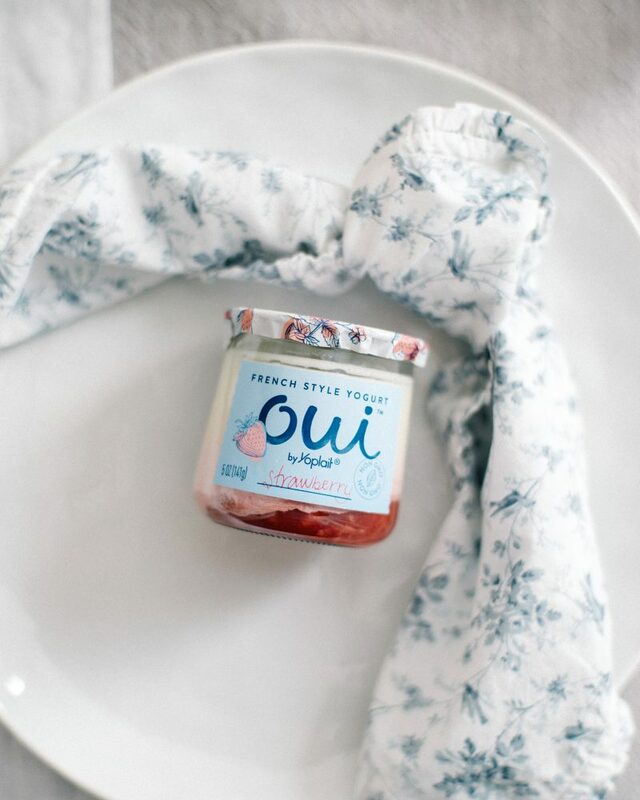 Plus, being a true Francophile, I was happy to be using a product that’s based on an authentic French recipe for the shoot. 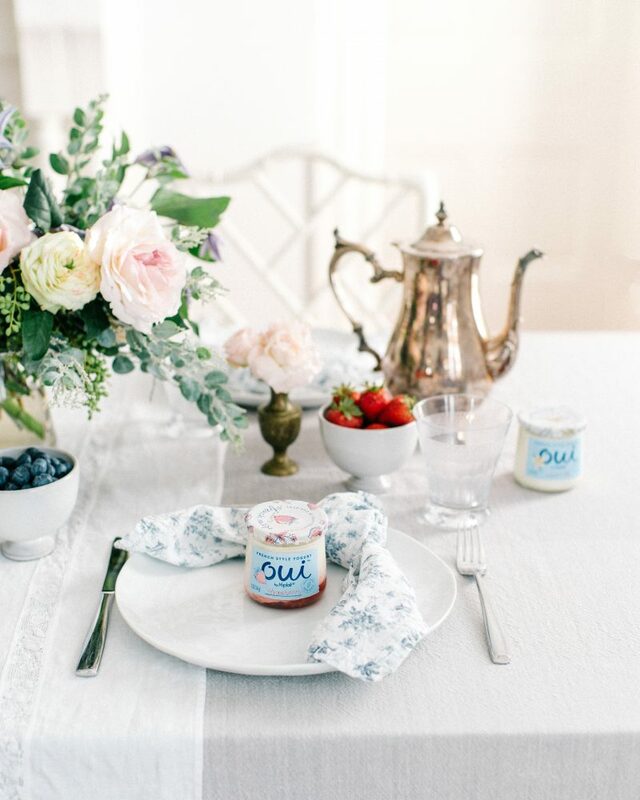 I served slices of fresh fruit, like peaches, blueberries, and strawberries, to complement the yogurt’s flavors. Chopped fruits make a simple and healthy treat, while giving plenty of color to any table setting. 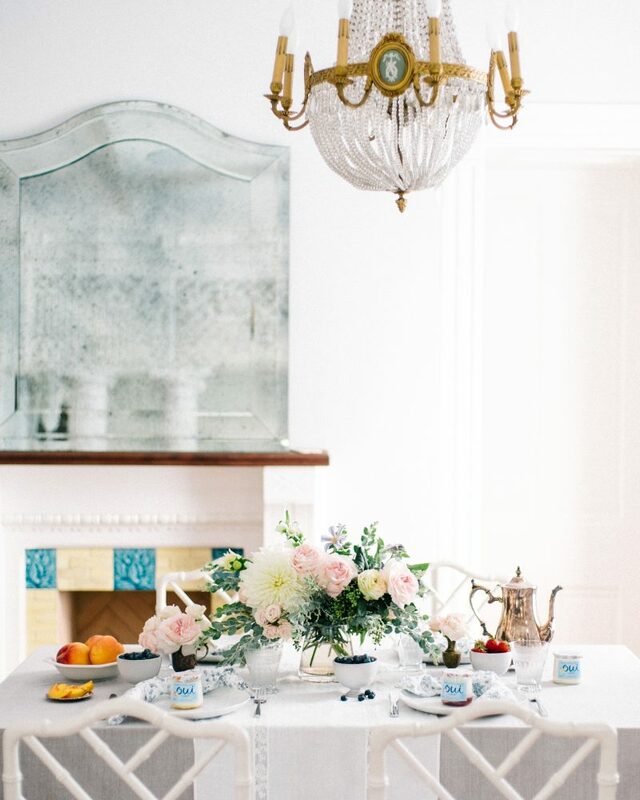 Drawing inspiration from the opulence of 18th century Versailles, I used a few pieces of antique tableware, such as a silver-plated tray and teapot set. 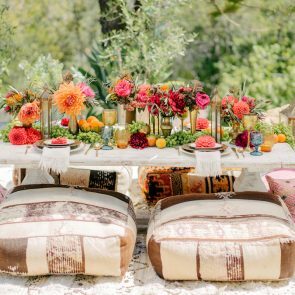 This juxtaposed nicely with the romantic, pastel bouquets of white chrysanthemum flowers, pink garden roses, and sweet-smelling eucalyptus. 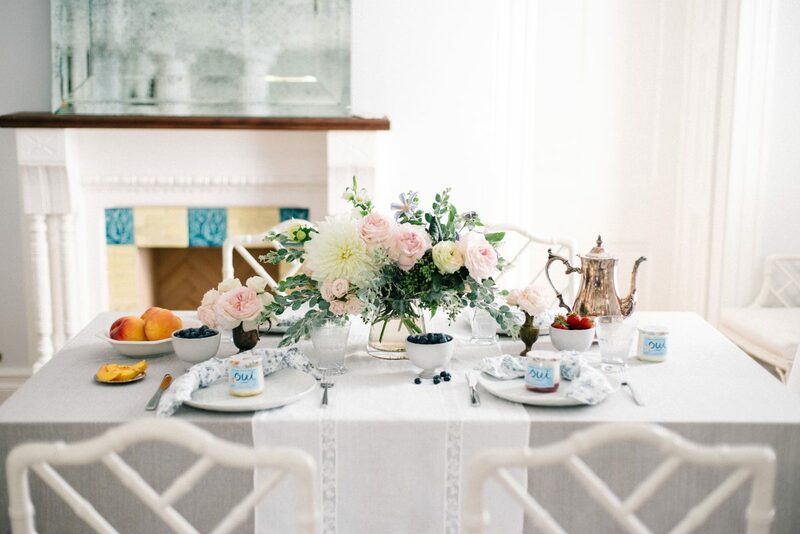 The table was set in white linen and I added white and blue napkins to give French countryside vibes. 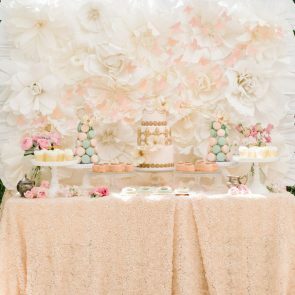 Are you looking to throw an afternoon party and want to serve something nutritious yet indulgent? 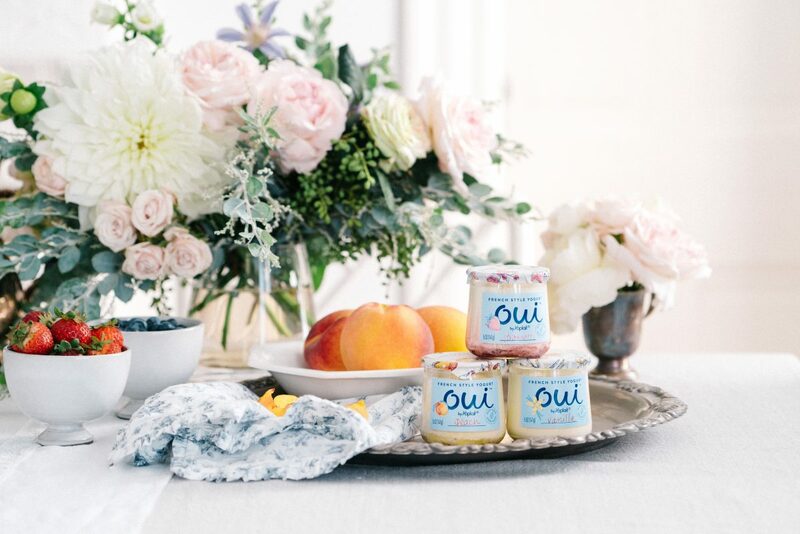 OUI yogurts are classy, refreshing, and make great substitutions for other sugar-loaded desserts. 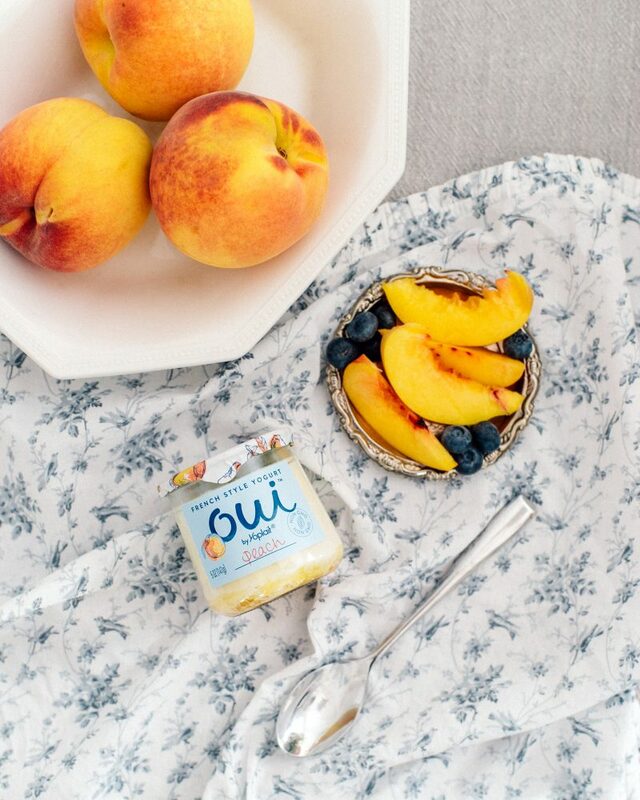 These yogurts are free from GMO and artificial ingredients, and packed with live cultures. 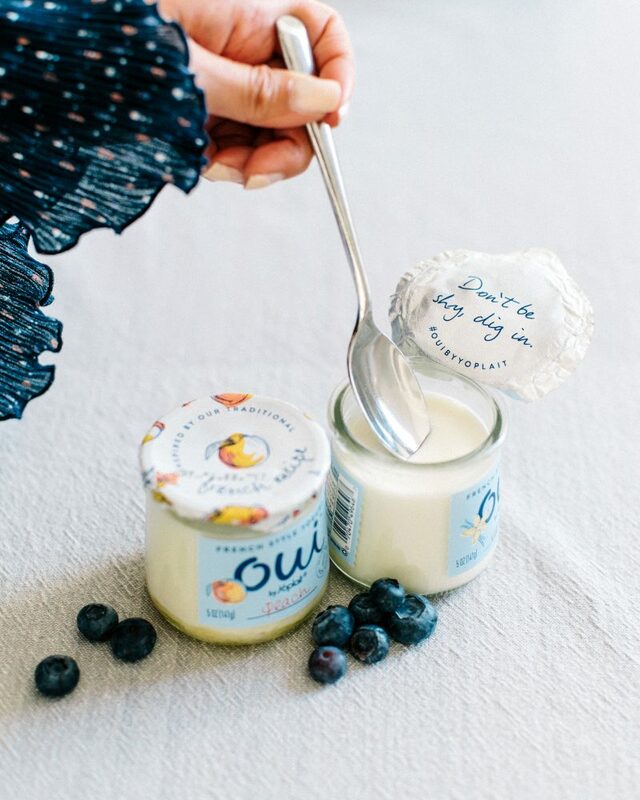 You can even provide a little element of surprise to your tea party, as your guests will read a cute note when they open their yogurt pots! Every flavor has a different quote printed on the back of the lid.